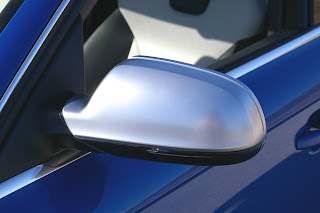 A short note on silver wing mirrors. In the past all wing mirrors were born equal and they were all made of some shiny metal. Note how vintage cars look right at home with such a set. Then we had black plastic wing mirrors. Then we had colour coded wing mirrors, wowwy! Then Audi went and screwed up everything by giving their fastest cars silver wing mirrors no matter what colour the car was. Now in principal this works fine after all there's plenty of good reason for a manufacturer to show how proud they are of their top models by giving them a signature. At first this detail was low key but then all the boy racers starting strapping them to their Micra's in the belief that these silvery mirrors would make their car go faster. What's worse is that after a while the option of a silver wing mirror crept onto many manufacturer's option lists and before you know it we have hoards of cars with blinged earrings on them. 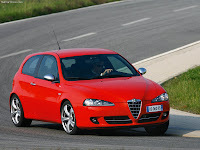 I'm convinced that even the owners of these cars don't know why they opted for them because they simply look terrible! Silver or chromed wing mirrors may have their place on a funky mini cooper but not on a red Alfa 147. I blame Audi for starting this mess. Vorsprung durch Technik means "lead through technology" not stupid silvery tacky plastic wing mirrors! ackauto.com offers Car Radiator in USA, Car eoc Radiator in USA, Car Radiator with eoc in USA, Car Radiator without eoc in USA. Find the right Radiator for your car. How Long Is An F1 Car?